SkyrimDuckSays ………. I love Skyrim this time of year! Some of you may remember my antics in the snow back in January. Well here I am 2 months later in March and to be honest there’s not a great deal of difference weather wise. I’ll tell you this for free if there’s a picture of me in the snow in August I’m leaving the country! SkyrimDuckSays ………. Love is in the air! 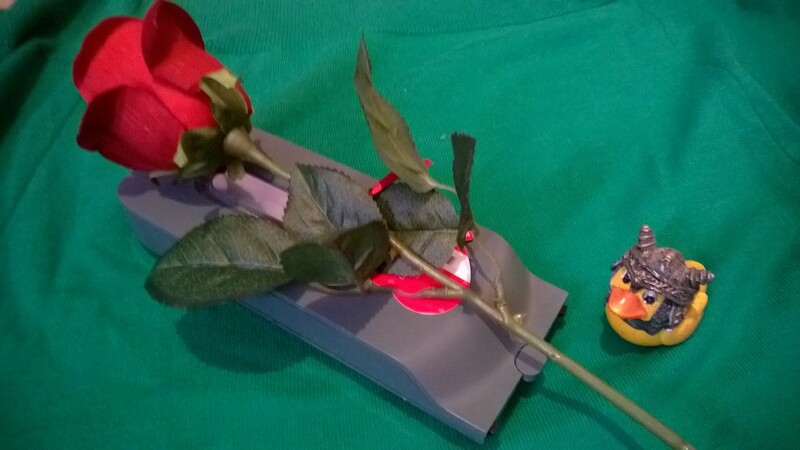 Happy Valentines Day everybody. Spend some time with the ones you love and failing that the games you love. After all isn’t that the next best thing? With the arrival of latest Skyrim add on Hearthfire I am now the proud owner of a brand new home. Ignoring, of course, the fact that I already own a residence in most major cities throughout Skyrim. However, I do actually get to build my new house myself this time, taking time out from my busy life to do so. I am only the dragonborn, arch mage of winterhold and leader of the thieves guild and the companions after all. I’ve got so much free time on my hands you wouldn’t believe. So anyway, if I get some wood and mine some resources I can build a house. Sound familiar? Add into the mix that you can now adopt children and you’ve basically got the results of a drunken one night stand between The Sims and Minecraft. What do I want children for anyway? I’m a lone adventurer, it’ll only be sad for everyone involved when a dragon eats one of them. My main grievance with Hearthfire lies within the actual building aspect of the game. Mainly that there is no creativity involved at all. You get plans, collect the necessary resources and build one thing before moving on to the next on the list and by the time you have finished the only thing you’ve really done is mined a bit of iron and nipped down the shops a few times inbetween. The end result being what the house would have looked like in the game regardless of who built it. I still love Skyrim, sadly I’m just not crazy for Hearthfire. However, for 400 Microsoft points I’m not going to complain about the extra hours of game play I’m going to get out of it. SkyrimDuckSays ………………….. Don’t ever call again. So in light of the fact that there is a new Call of Duty game being released whether I like it or not I thought I’d give the COD boys a quick bell and invite them over to Skyrim for a chat. That afternoon, they rolled up in their tank and chopper. 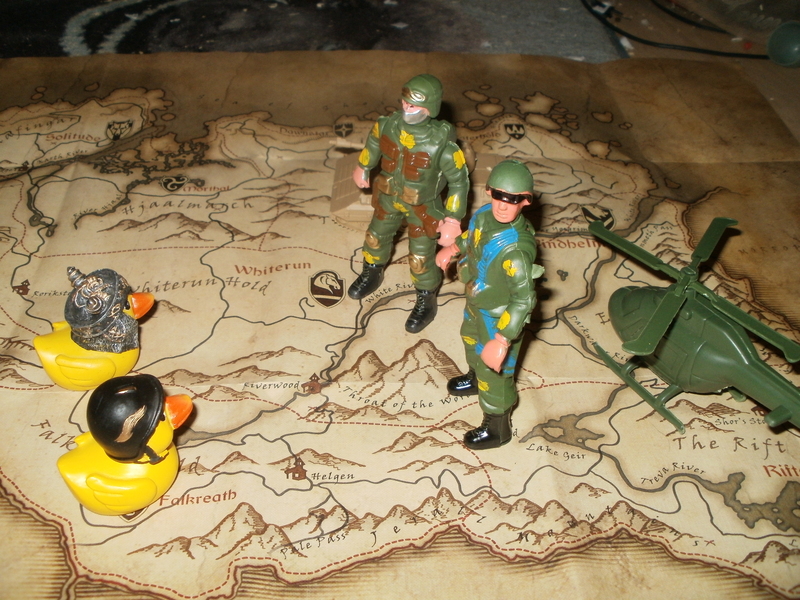 Showy as ever but I was feeling brave, I had SoldierDuck by my side after all. He’s seriously hard, for a duck. “Right lads” I said, “this is a mission of peace, I know we’ve had our differences in the past but lets let bygones be bygones”. They only went and bloody shot me. 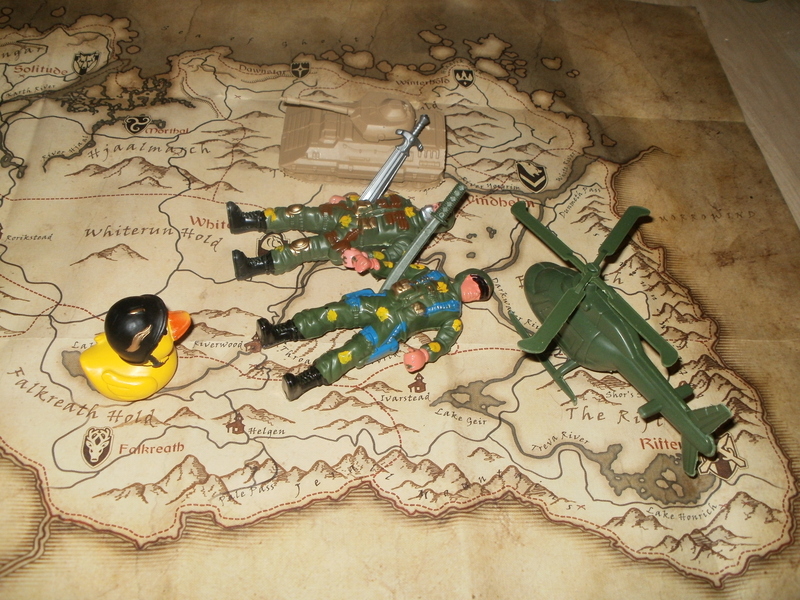 Luckily SoldierDuck was on hand to bandage me up and seek revenge. Within seconds he’d stabbed them both, one with his own sword. “Good work SoldierDuck” I said “but lets stick to Halo in the future”.